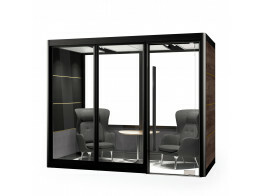 Meeting Pods provide enclosed sound conrolled meeting spaces, office and breakout spaces, isolating the occupants from the external office environment. Acoustic Meeting Pods are great for creating effective private third-place meeting spaces. 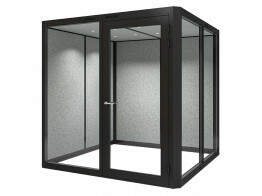 They are mobile, cost effective and can be set up anywhere within the open office, to create a quiet area. Office Meeting Pods are sound absorbing to an extent depending on the specification giving the users speech privacy. Après supply screen based meeting pods in a range of models and specification that are sure to meet your office requirements. All our meeting pods come standard with integrated lighting, power and data points which make these acoustic pods more welcoming to be used as either private work areas, brain storming rooms or meeting rooms. 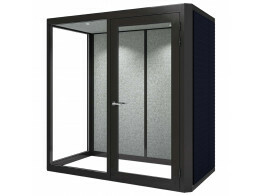 If required, the meeting pods can be fitted with audio and visual equipment. 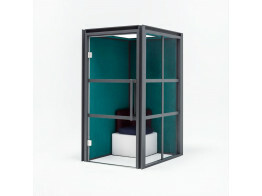 Our range of acoustic meeting pod solutions are made to order. We can supply standard pod sizes or tailor your acoustic pods to your exact requirements from the height, width, radius including the finish. 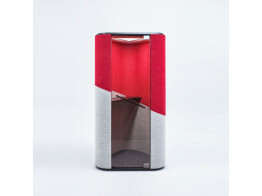 Our acoustic meeting pod collecton offer you a large range of fabric finishes and frame colours to choose from, glazing and laminates. You can also add additional accessories like white boards to your meeting pods. If you are struggling with acoustic properties in your open plan space pursue one of our acoustic office screens to see if they will provide a temporary solution to your problem in your open plan office. Transform your open plan office space with a screen meeting pod. Contact us today for more information on our meeting pods and your personalized quotation. 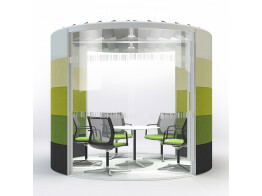 Spacio Office Meeting Pods with double glazing giving you optimum speech sound privacy. Designed for several persons, to be used as a meeting room or an office with several work stations. 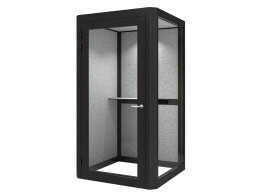 This version of the Plenty Pod is designed for one person, to be used as a phone booth. Studiobricks Hola offers a comfortable working environment and is perfect for making phone calls or video conferencing. The Hako soundproof lounge pods improve the acoustic quality of contemporary office spaces. 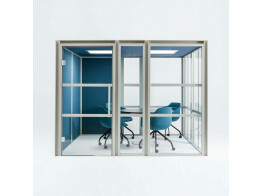 The Hako soundproof meeting pods improve the acoustic quality of contemporary office spaces. Inspired by industrial architecture and warehouses – the Hako soundproof pods improve the acoustic quality of contemporary office spaces. Quiet zones in demanding and buzzing office spaces – the Hana acoustic pods work well in most dynamic environment. 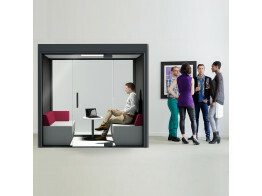 Spacio Double Lounge Pod is a back-to-back pod solution for the open office area. 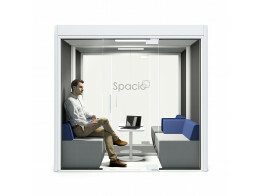 Spacio Lounge Pods provide private acoustic meeting spaces in open plan offices. Human Space Meeting Pods provide an acoustic private room solution without affecting your office building. Spacio Grand Meeting Pods is a family of executive level acoustic room-in-room solutions. 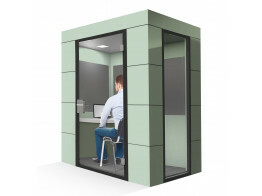 Office Bricks Mini Pods is a sound proof single user privacy work pod ideal for calls and working. 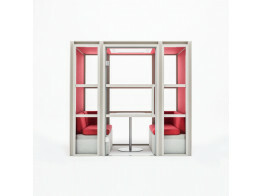 Bricks Meeting Pod is a soundproof two person meeting room solution. Spacio Mini Work Pod Slider is a single person privacy pod for getting work done. Air Acoustic Pods offer various size and shape meeting rooms for convenient privacy in the office. Air Meeting Pods offer various sizes and shapes for sound insulated acoustic privacy within the office. Register with us and we will send you our price list in 30 seconds. Europe? US? Canada? We deliver our products across the globe. Read up on how Spacio Pods can benefit your breakout area.